As a Respiratory Therapist, it is crucially important to know and understand the proper management of mechanical ventilation; period. And this applies to Respiratory Therapy students as well, because you must know this information for your classes and for the board exams as well. 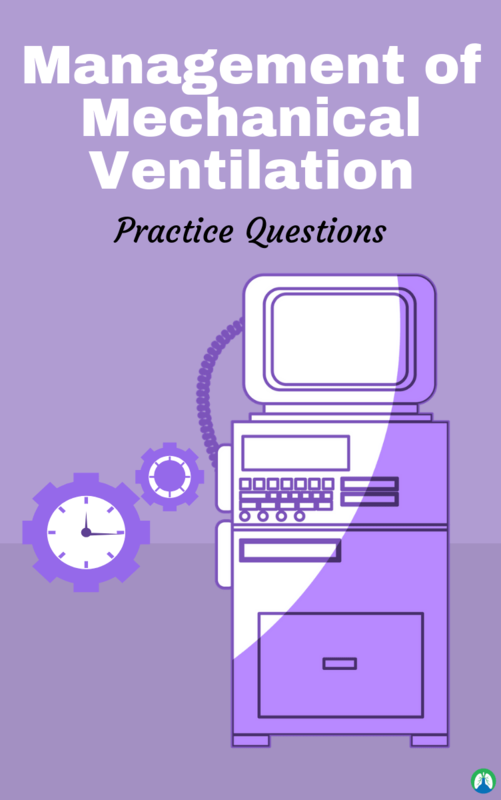 That is why we put together this study guide with practice questions all about managing patients that are on the mechanical ventilator. So let’s go ahead and dive right in! 1. The doctor asks the respiratory therapist to adjust the ventilator in order to improve the oxygenation status of the patient with a normal V/Q status. What ventilatory adjustment would have the most direct effect on oxygenation? Increase the oxygen concentration FIO2. 2. Why is an endotracheal tube sometimes shortened? Because a shorter ET tube facilitates airway management and secretion removal. 3. The primary purpose of permissive hypercapnia is to reduce the patients ______ during mechanical ventilation? 4. Permissive hypercapnia is a technique in which the mechanical tidal volume is reduced. This change is done intentionally to increase what? 5. CPAP and PEEP may be used to decrease or correct refractory hypoxemia caused by what? 6. Compensated respiratory acidosis and compensated metabolic alkalosis have similar blood gas characteristics, normal pH, high PaCO2, and high HC03. One useful clue to differentiate these two conditions is what? In compensated respiratory acidosis, the pH is on the acidotic side of the normal range. 7. During patient rounds in the ICU, the high-pressure alarm of the ventilator is triggered. This condition is likely caused by what? 8. A patient with severe sepsis has been on the mechanical ventilator for two weeks. What electrolytes are most likely out of the normal range? 9. Decreased muscle function, flattened T-wave and depressed ST segment on the electric cardiogram and diminished bowel sounds are some signs of what? 10. Proper nutrition is essential for patients receiving mechanical ventilation because undernutrition can cause what? Fatigue of the respiratory muscles. 11. What is a reason that someone would need a ventilator? 12. What are the gas exchange levels that define respiratory failure? A PaCO2 greater than 50 mmHg and a PaO2 less than 60 mmHg due to insufficient gas exchange or ventilation. 13. What are the 2 lung capacity/lung measures that we should look at when determining if the patient has respiratory failure? Tidal volume and respiratory rate. 14. What specific type of ventilation allows for higher oxygen concentration and higher airway pressures to “recruit” atelectatic areas of the lung to improve the PaO2? Mechanical positive airway pressure ventilation. 15. What is a normal tidal volume? 500 ml, but it depends on the patient’s ideal body weight. 16. What is a normal minute volume? 17. What two ventilator numbers should you look at to see if mobilization is a good idea? 18. What is a normal FiO2? 21% which is the same as room air. 19. What % FiO2 is not good? 20. What is a normal PEEP? 21. What type of ventilation mode does 100% of the work? Assist Control. It has a set rate and a set volume. 22. What type of ventilation is used to wean patients off the ventilator and should not be used on patients who need the ventilator to do all the work? 23. What can the patient control when on pressure support ventilation? The duration of the breath. 24. What 2 things does CPAP do for the patient? It reduces the initial resistance to inspiration and improves alveolar inflation. 25. What are some causes of a high-pressure alarm on the ventilator? Kink in the tube, coughing, secretions, bronchospasm, other causes of reduced lung compliance, high respiratory rate (anxiety, fatigue), apnea. 26. What are the indications for suctioning? Secretions by sight, sound, de-saturation, high-pressure alarm. 27. Ventilator settings such as FiO2 and PEEP are used to regulate a patient’s what? 28. A mechanically ventilated patient during postoperative recovery has a recent PaCO2 of 53 mmHg. The doctor wants to reduce the PaCO2 to near 40 mmHg. The most common method to achieve this is what? 29. When the ventilator frequency is over 20/min, the incidence of what is increased? Auto-PEEP; especially when the pressure support ventilation is also used. 30. Why is it undesirable to increase the ventilator tidal volume in order to increase the minute ventilation or to reduce the PaCO2? A higher tidal volume causes a higher PIP, which in turn can increase the incidence of ventilator-related lung injury (barotrauma). 31. The patient can help to improve the minute ventilation by increasing what? The spontaneous tidal volume or frequency. 32. During weaning attempts, for patients who are unable to maintain prolonged spontaneous ventilation or to overcome airway resistance, what should be tired? 33. The level of pressure support is usually started at 10-15 cm H20 and it is adjusted until when? Until the spontaneous tidal volume increases to an acceptable level. 34. Some practitioners prefer to titrate the pressure support level until the spontaneous respiratory rate is reduced to a desirable level. This change in respiratory rate is usually observed in conjunction with? An increase in the spontaneous tidal volume. 35. Describe the potential effects of using an excessive ventilator tidal volume and the effects of using an insufficient ventilator tidal volume? Excessive tidal volumes increase the likelihood of ventilator-related lung injuries (barotrauma, hyperventilation). Insufficient tidal volumes may lead to hypoventilation and atelectasis (increased CO2). 36. Why are patients with extremely high airway resistance or low compliance more likely to develop ventilator related lung injuries? Patients with low compliance do not have very stretchable lungs, therefore, high pressure is going to strain the lungs more so than someone with good compliance. 37. The incidence of ventilator-induced lung injuries may be reduced how? By keeping the plateau pressure below 35 cm H20 because this pressure measurement is the best estimate of the average peak alveolar pressure. 38. The small tidal volume used in permissive hypercapnia often causes what? Alveolar hypoventilation, CO2 retention, and respiratory acidosis. 39. Severe acidosis may cause what? Central nervous dysfunction, intracranial hypertension, and neuromuscular weakness. 41. Refractory hypoxemia is usually caused by what? Intrapulmonary shunting, and it does not respond very well to oxygen therapy alone. 42. During oxygen therapy, excessive oxygen should be avoided because of what? Possible oxygen toxicity, ciliary impairment, and lung damage. 43. Anemic hypoxia is likely when the hemoglobin level is less than what? 44. CPAP is only suitable for patients who have adequate lung mechanics and can sustain what? 45. What is optimal peep? The level of peep that delivers the greatest amount of oxygenation. Higher does not always mean better. 46. During weaning of a patent who has been using 10 cmH20 of PEEP and 70% oxygen, the FiO2 should be reduced first until when? Until it reaches about 40%. 47. A common application of inverse ratio ventilation (IRV) is for the treatment of patients with what? Patients with ARDS who are not responding to conventional mechanical ventilation. 48. What is Extracorporeal membrane oxygenation (ECMO)? It is a method used to provide oxygenation of the blood outside the body of an infant. 49. In HFOV, a lower PaCO2 may be achieved by using what? A higher amplitude or a lower frequency. 50. The mPaw is primarily affected by the what? The power setting on HFOV. 51. When respiratory alkalosis is occurring during weaning from mechanical ventilation, the presence of hypoxia or metabolic acidosis must first be ruled out. Otherwise, reducing the respiratory rate on the ventilator will do what? It will further induce hyperventilation and increase the WOB. 52. When a patient with COPD is receiving excessive ventilation during mechanical ventilation, acute hyperventilation may cause the patients arterial blood gasses to resemble what? 53. If hypoventilation occurs due to excessive sedatives, the measurement of pulmonary mechanics should? The measurement should be delayed until the sedation decreases. 54. What are some conditions that may trigger the low-pressure alarm? A loss of circuit or system pressure, premature termination of the inspiratory phase, and inappropriate ventilator settings. 55. The high-pressure alarm is triggered when the circuit pressure reaches or exceeds what? 56. What are some conditions that may trigger the high-pressure alarm? An increase of airflow resistance, decreased of lung compliance, and a decrease of chest wall compliance. 57. List the mechanical factors that may trigger the high-pressure alarm due to an increase of airflow resistance? Kinking of the ET tube, kinking of the circuit, blocked exhalation manifold, water in the circuit, and mainstem bronchial intubation. 58. List some of the patient factors that may trigger the high pressure alarm due to an increase of airflow resistance? Bronchospasm, coughing, patient-ventilator dyssynchrony, secretions in the ET tube, biting on the ET tube, and mucus plugging. 59. Tachypnea during mechanical ventilation may not be due to? Excessive inspiratory flow or pressure support. Tachypnea shortens the expiratory time, increases the MAP, and alters the raw ventilation/perfusion relationship. 61. The apnea or low-frequency alarm is triggered when? When the total frequency drops below the low-frequency limit set on the ventilator. 62. The low PEEP alarm is triggered when the actual PEEP level drops below the preset low PEEP limit. Failure of the ventilator circuit to hold the PEEP is usually due to what? A leakage in the circuit or endotracheal (ET) tube cuff. 63. Presence of excessive auto-PEEP may trigger the high PEEP alarm. What conditions may lead to the development of auto-PEEP? Air trapping, insufficient inspiratory flow, insufficient expiratory time, and inadequate inspiratory time. 64. Auto-PEEP caused by air trapping may be corrected or minimized by using a? 65. Auto-PEEP is commonly associated with what? Pressure support ventilation, sufficient airflow obstruction, respiratory frequencies of greater than 20/min, and insufficient inspiratory flow rates. 66. Auto-PEEP may be reduced by? Decreasing the tidal volume or mandatory frequency or increasing the inspiratory flow rate on the ventilator. 67. Increasing the inspiratory flow rate on the ventilator does what? It decreases the I-time and increases the E-time, allowing time for exhalation. 68. When setting changes cannot correct auto-PEEP, therapeutic PEEP may be for what? It is used to reduce the effects of auto-PEEP that is due to air trapping in the small airways. 69. The effective (delivered) tidal volume during mechanical ventilation is lower than the set tidal volume because the ventilator circuit is compliant to pressure and expands during inspiration. What does this cause? As a result of this, a portion of the set tidal volume is not delivered to the patient. 70. To minimize volume loss due to the effects of circuit compliance, the ventilator circuit should? It should have a low circuit compliance. 71. An HME may be used as what? It may be used as a temporary humidification device for intubated patients. 72. If a metered dose inhaler is used in conjunction with an HME, the? HME must be placed between the MDI and the patient. 73. The optimal interval for ventilator circuit change is what? Only when it is visibly soiled. 74. According to Poiseuille’s Law, when the radius of an airway is reduced by 50%, the driving pressure is affected how? It is increased 16 times to maintain the same flow rate. 75. The use of low tidal volumes, prone positioning, and tracheal gas insufflation are what? They are adjunctive measurement strategies in mechanical ventilation. 76. The ideal tidal volume for mechanical ventilation should produce a plateau pressure of what? Less than 35 cm H20 because this pressure reading reflects the condition of the lung parenchyma. 77. What are the three goals of prone positioning? Improve oxygenation, reduce inspiratory pressures (peak and plateau), and reduce atelectasis and shunting. 78. Prone positioning improves the oxygenation parameter rapidly. What does it not do? It does not increase the survival rate of patients with ARDS, unfortunately. 79. The primary indication for prone positioning is? It is used on ARDS with an increasing oxygen index (OI) while supine and during mechanical ventilation. 80. What is the formula of Oxygen Index? 81. What are the contraindications for prone positioning? Increased intracranial pressure, hemodynamic instability, spinal cord injury, history of abdominal or thoracic surgery, flail chest, and inability to tolerate the position. 82. What is Tracheal Gas Insufflation? Tracheal gas insufflation (TGI) provides a continuous or phasic flow directly into the ET tube during mechanical ventilation. 83. What are some strategies used to improve ventilation? Increase the tidal volume, increase the respiratory rate, use ventilator circuits with low compressible volume, and decrease dead space. 84. What are some strategies used to improve oxygenation? Increase the FiO2, increase the PEEP, improve ventilation to improve oxygenation, normal hemoglobin levels, initiate CPAP, improve circulation, and initiate IRV, ECMO, or HFOV. 85. What are the things to look at when doing circuit care? Check patency (condensation), humidity and temperature, and it should be changed only when it visibly soiled. 86. What should you increase the FiO2 to before adjusting the PEEP level? 87. What mode would you consider using for improving oxygenation? APRV because it helps to recruit alveoli. 88. What do you need to monitor when looking for the optimal PEEP level? Monitor the SpO2 and cardiac output. It’s not always at the best level when the SpO2 is the highest; you need to make sure the cardiac output is good as well. 89. What needs to be done if the patient is hypoventilating or acidotic? The patient will have increased CO2 therefore the respiratory rate or tidal volume needs to be increased. 90. What is the best treatment of choice for hypoxia? 91. If the respiratory rate is above 20, what does that increase the chances of? 92. What are the two ways that pressure support is used? Low: used to overcome resistance in the circuit. High: used to target a tidal volume. 93. What is permissive hypercapnia? It is the act of letting the CO2 build up to prevent barotrauma and letting the body compensate by increasing the bicarb. 94. What are the tidal volume guidelines and what do these guidelines prevent? The normal tidal volume should be set at 6-8 mL/kg of ideal body weight, and they prevent ALI and ARDS. A setting lower than 6 mL/kg will increase the changes of hypoventilation and atelectasis. 95. What increases the likelihood of oxygen toxicity? An FiO2 of 100% for longer than 12-24 hours. 96. What is the difference between CPAP and PEEP? CPAP is used for spontaneously breathing patients. 97. What do we like the FiO2 at before we extubate? 98. How does IRV work? The I:E is switched; there is a longer I-time and shorter E-time. It is used for alveoli recruitment. You must check to see if it is compensated or not. Compensated means it is chronic and this is the patient’s baseline. 100. What is the most common reason for a low-pressure alarm? And that wraps up our study guide about the management of mechanical ventilation. I hope this information was helpful and I hope you can use it to ace your exams. Most importantly, though, I hope you can truly learn and retain this information so that you’ll have it throughout your career as a Respiratory Therapy. Thanks for reading and as always, breathe easy my friend.